Board the barrier free main decks of a Star Line Hydro-Jet ferry or one of our Classic ferries and enjoy a panoramic view of the Straits that includes the Mackinac Bridge. Sit back, relax and enjoy the area’s scenic beauty from the comfort of our glass enclosed cabins or our open air observation decks. Watch as Star Line’s Hydro-Jets produce their distinctive 35′ rooster tail spray! Surrey Hills Museum – enjoy a leisurely visit through the museum displaying historical carriages and browse on-site gift shops. Your tour will resume aboard their open 3-horse carriage. 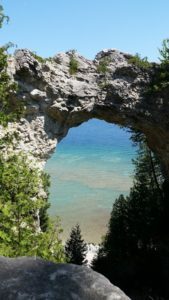 Arch Rock is your next stop for an approximately 5 minute viewing and picture taking adventure of one of Mackinac Island’s most famous rock formations. Fort Mackinac Avenue of Flags – Spend as much time as you wish enjoying historic Fort Mackinac. As passengers depart arriving carriages, you may re-board as space is available to continue your island tour. Return to Surrey Hills Museum and board one of the 2-horse carriages to venture back downtown or end at Grand Hotel. 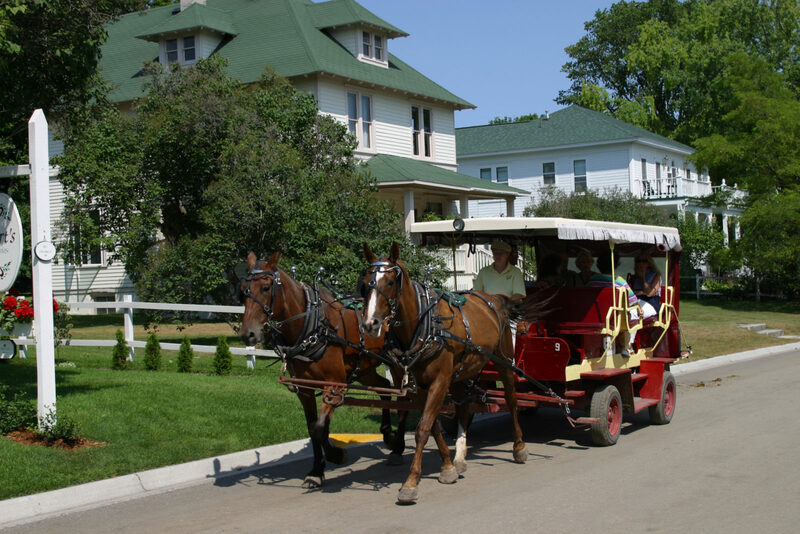 Enhance your Experience on Mackinac Island by adding one or ALL of our mackPASS add-ons!! Self Guided Tour – You can spend all day or just an hour. 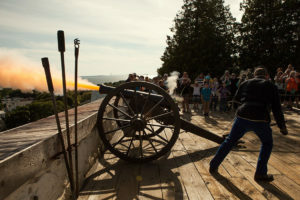 Fort Mackinac has live reenactments every 45 minutes in the peak of summer. Constructed by the British during the American Revolution, Fort Mackinac served as an imposing sentinel in the Straits of Mackinac for 115 years. Within its 14 original buildings, you’ll enjoy informative and interactive exhibits, a children’s play area, and a Victorian-themed museum store. Outside, our 1880’s soldier interpreters play concerts of military music, fire rifles on the parade ground, and deliver a cannon salute over the harbor. Enjoy “America’s Summer Place” and walk the world’s longest front porch by adding on Admission Tickets to Grand Hotel if you are a non-guest. Grand Hotel does adhere to an evening dress code after 6:30 PM. Please click here for more dress code information. Grand Hotel is CLOSED to non-registered guests on May 28th through May 31st, 2019. Put that check mark next to the Grand Hotel Lunch Buffet on your Bucket List and purchase a ticket today! Grand Hotel Luncheon Buffet includes your admission to Grand Hotel. One of the most unique lunches you will enjoy with views of the Straits of Mackinac from their Main Dining Room that seats 1200 people! Their desserts are to die for and cannot be missed. The Grand Hotel Lunch Buffet is served most days from 12 PM to 2 PM. Please see a list of black out (closed) dates: May 15th, 16th, 17th, 24th, 28th, 29th, 30th, 31st, September 21st, October 16th, 17th, and 18th, 2019. Original Mackinac Island Butterfly House. It is the 1st of its kind in Michigan, and the 3rd oldest LIVE butterfly exhibit in the United States. 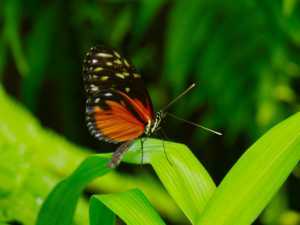 The world-renowned facility has 1800 sq ft of tropical garden filled with hundreds of live butterflies from four continents. Located behind Historic St. Anne’s Catholic Church off Main Street.